Superior Brains: Who’s to say that we’re the best? As a young woman, Michele Swanson ’82 did not anticipate attending an Ivy League college. “I was one of six kids growing up in Ohio. My dad was the first in his family to go to college,” she said. Now, Swanson is a professor of microbiology at the University of Michigan and a leader in the American Society for Microbiology. Swanson credits her success to the mentors who saw her potential as a young adult. Following their examples, she now mentors and advocates for young scientists herself. She believes in the importance of public education on topics in science, and even co-hosts a podcast to spread knowledge of microbiology. Michele Swanson is a professor at the University of Michigan Medical School. Image courtesy of Michele Swanson. Swanson’s journey to New Haven began when she met the Yale field hockey coach at a summer camp in Michigan. Soon, she was playing varsity field hockey and softball at Yale. She also held a campus job and served as a freshman counselor for Davenport College. Her senior year, she took an inspirational class in developmental biology. “Professor John Trinkaus taught with such passion that I really got interested in thinking like an experimentalist,” Swanson said. Although it was too late for her to get involved in research on campus, she secured a job as a lab technician at Rockefeller University upon graduation. Swanson reflects warmly on her early years in the laboratory. At the time, she was content to assist graduate students, but realized many of their exciting scientific discussions were beyond her reach. She remembers the day when she asked her laboratory head, Samuel C. Silverstein, for a recommendation letter to apply for master’s degree programs, only to have her initial request denied. “Instead, he sat me down and said, ‘I want you to apply for PhD programs. I want you to think big and get the best training you can at each stage of your career,’” she said. Shortly thereafter, Swanson began graduate school at Columbia University before moving with her husband, also a graduate student, to Harvard. There, she would earn a PhD in genetics with Fred Winston while also starting a family. In spite of the obstacles she faced as a mother, Swanson persisted, with encouragement from her thesis advisor and other faculty. After taking a year off to spend time with her children, Swanson completed her postdoctoral training and was recruited to the faculty at the University of Michigan, which jointly hired her husband. There, she began a research program on how Legionella pneumophila, the bacterium that causes Legionnaire’s disease, thrives in immune cells. Her lab continues to make significant contributions to our understanding of microbial infections and immunity. Remembering her own mentors, Swanson works to support other young scientists. To this end, she has served in many leadership positions at the University of Michigan. She is currently the director of the Office of Postdoctoral Studies. She has also been a member of the President’s Advisory Commission on Women’s Issues, which develops policies, practices, and procedures to enhance gender and racial equity. “I want to make sure that other talented people, and women in particular, have the same opportunities I had,” Swanson said. Apart from her work at the University of Michigan, Swanson is involved in the American Society for Microbiology, which publishes journals, hosts professional events, and guides public outreach efforts to advance the microbial sciences. 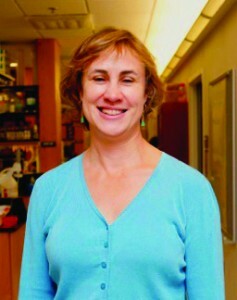 She was recently appointed as chair of the Board of Governors of the American Academy for Microbiology. She also co-hosts a podcast entitled This Week in Microbiology. The podcast has aired since 2011, garnering 1.2 million downloads over the course of 111 episodes. Swanson sees this podcast as an important effort to educate the public on how microbes influence our lives. Swanson believes that her experience at Yale reinforced in her the values she lives by today, especially her desire to give back. “I really believe the culture at Yale strives to instill that spirit in the community, that we’re privileged to be there but also have an obligation to step up and take leadership roles and give back,” she said. Swanson models these values through her mentorship, leadership, and commitment to public outreach. Her path to Yale and academia shows that the difference between chance and fate is often decided by one’s own passion and persistence. Cover Image: Immunofluorescence microscopy images are shown with macrophage nuclei stained blue, tubulin stained green, and Legionella pneumophila stained red. Image courtesy of Michele Swanson.